Too many companies start building products before they know who their customers are. They build around a problem they’ve experienced first-hand, or a gut feeling that they’ve got a big idea that will change the world. None of these reasons help a company build a product as efficiently as possible. Whether you’re self-funded or venture funded, you have limited cash on your hands—especially in the beginning. The moment you start building something, a clock starts ticking. When you don’t know who your audience is from the start, you end up wasting your most precious resource: time. 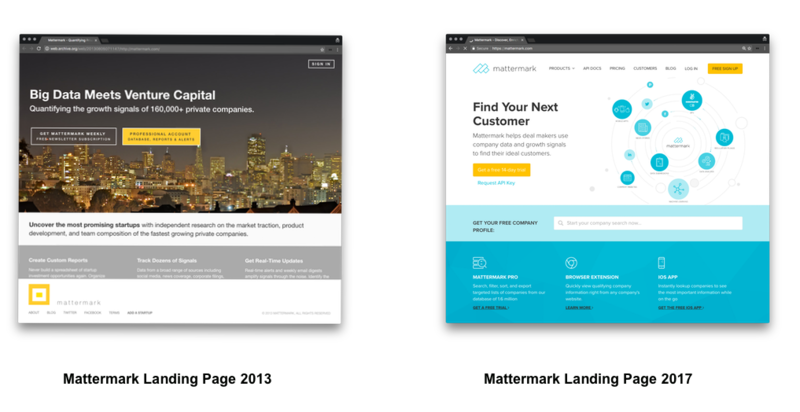 Mattermark was able to pivot, but it didn’t come without some hard lessons. One of them was surely this: You can build a different product, but it’s harder to build a brand new customer base. Research your customers (even when you don’t have any). You have to be customer-focused, even when you don’t have any customers. The paradox is that if you don’t have any customers, it’s hard to figure out what they want and where to start. If you start building your product too early, you risk building for the wrong customers. That’s why you need to learn more by researching your customer. Doing research is cheaper than writing code. It provides you with learnings that you can iterate on so you’re never starting from scratch. Research is a habit you build that guides all of the decisions you make at every stage of your company. You might as well start from day zero; that way, you can get as close to your target customer as possible before investing resources into development, marketing, and sales. Figure out what company or behaviors you’re disrupting . Go out and understand all of the different use cases. Let’s dive into each of these steps in greater detail. Do competitive research to identify behaviors to disrupt. Since it’s not always obvious who your customers are, start by identifying competing companies and behaviors. Figure out where your competitors are failing so you can turn it around to your advantage. Here’s an example: In the early 2000s, Microsoft Excel was the killer app for the PC. It was more powerful and flexible than anything else—and Microsoft owned virtually a monopoly on the market. Yet in 2003, a tiny company called 2Web Technologies was able to plant the seeds for Excel’s disruption. One of the lead engineers at 2Web Technologies had worked on maintaining complex spreadsheets in Excel for big banks like J.P. Morgan. These banks wanted a way to easily share data inside of spreadsheets with clients without revealing the proprietary models that made them tick. 2Web built a plugin for Excel that uploaded a spreadsheet model to a server, making it really easy for people to convert Excel files into web apps—without spending tons of money and weeks on development. 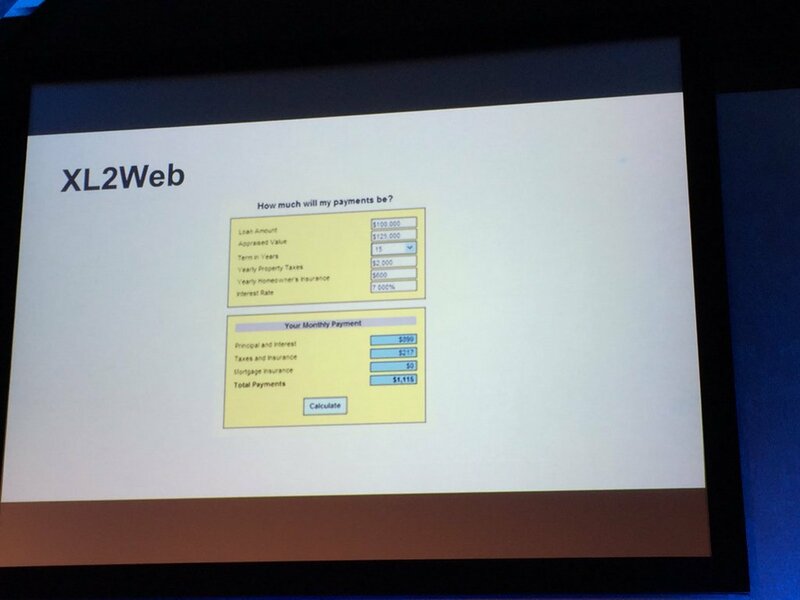 2Web’s team literally built a web server for remote Excel spreadsheets. They’d discovered a very specific weakness within Excel, and created a product around it. Soon after, Google acquired 2Web and turned it into Google Sheets. At the heart of this was “intelligent recalc,” a feature Klunder designed that allowed you to change numbers in a spreadsheet to update specific cells, rather than the entire spreadsheet. This meant you could actually use Excel to do a lot of early jobs without needing an expensive mainframe. 2Web and Google didn’t create a better spreadsheet than Excel. Sheets didn’t launch with pivot tables or customizable templates. It didn’t matter because Sheets did one thing completely beyond Excel’s scope: allowing multiple people to edit the same spreadsheet at the same time. The team at 2Web technologies didn’t initially start out trying to displace Excel. They looked at the solution that everyone was using—Microsoft Excel—and identified where it fell flat for a very specific segment of users. When you only have a vague idea of the problem you’re trying to solve, don’t skip a step by thinking about the technology you could build. Identify the existing solutions that people in your space are using—then dig deeper into how they’re being used. Do customer research to understand use cases. What makes this tricky is that not every problem you want to solve is visible. If you’re thinking about building anything, from a sales intelligence tool to a productivity app, you might have direct competitors. But, you’re probably also competing with Microsoft Excel. That’s why you have to understand why people are using these products. Narrowing in on behaviors will help you figure out where to focus. Airtable, a hybrid between a spreadsheet and a relational database, has been executing on this by tearing down the use cases of Google Sheets and Microsoft Excel. Airtable allows you to easily create a database for just about anything, from a personal to-do list to a CRM for small businesses. What Airtable figured out is that products like Google Sheets are typically used to structure data rather than make calculations—but those aren’t the things that Google Sheets was designed to do. The problem with using traditional databases like Microsoft Access is that they require writing code, which most people using the databases can’t do. The problem with using Google Sheets or Microsoft Excel as a database system is that to link tables together, you have to do stuff like create junction tables. For the end user, there’s a whole lot of pain. Airtable’s core product took these complexities and dealt with them on the back end. They solved the hard technical problem of creating real-time sync and collaboration for a database, simplifying it into a simple and easy-to-use interface on the front end. When Airtable initially launched, it didn’t look new or revolutionary. In fact, it looked a lot like Google Sheets. What makes Airtable different is that it’s solving for a wide variety of use cases better than Google Sheets is. The biggest opportunities for your product rarely have to do with how much better, faster, or more innovative your product is. By researching and really understanding all of the different use cases for competing products, you start to figure out which customer needs the competition is failing to serve. That’s your ideal starting point for building your product. How to process research for opportunities. Once you’ve researched the competition and their customers, you have to identify what use cases you actually want to solve for. Map out all of the different use-cases you discover onto the grid above to find opportunities for building your product. You want to build your core, paid product around use cases that fall into the non-competitive and lucrative quadrant (top right). That’s where your highest-value customers are, so start building for them early. For crowded markets, you need to figure out what your point-of-entry will be—whether it’s building a freemium product, or a tool, or a gap in the competition. Everything you build costs time and money, which are both extremely scarce resources as you’re getting started. Prioritize all of the possible opportunities by weighing how hard they’ll be to pull off—and the potential upside of each opportunity for your business. Having this roadmap helps you make decisions and execute faster once you start building. Identify the common use cases that high-LTV customer personas share. Prioritize your roadmap and build specialized features according to these verticals—but keep your eyes on bigger movements in the market. Sooner or later, your competition will take notice. To survive, you’ll have to expand and do more for the customer. A good example of this is Front, a shared inbox for teams. 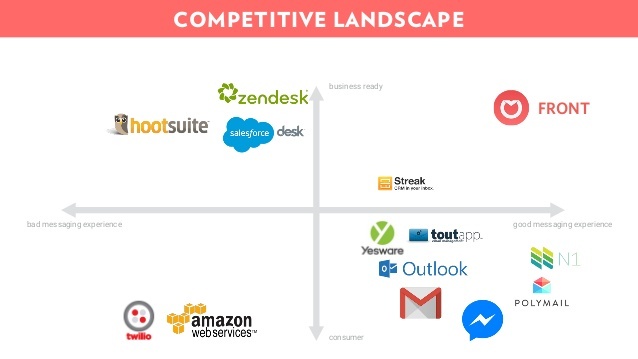 Front found that while the consumer space was saturated with great messaging products, businesses relied on inflexible solutions like Zendesk and Salesforce Desk for email. By using shared inboxes as a wedge into email for business, Front was able to grow MRR by 5.4x in 2016. Use cases that fall within the top-left quadrant present good opportunities for freemium products, because they help drive adoption toward your paid, premium products in the top-right quadrant. Products in this category cost more money to build, but they’re cheaper in the long-term because they help you acquire customers in a more cost-effective way. ProfitWell, a metrics dashboard for SaaS companies found that although they had a rapidly growing market, the LTV for metrics dashboards simply wasn’t high enough to justify the cost of customer acquisition. They released the bottom tier of their product for free to take a bigger piece of the market instead. Wait until you’ve built a product and developed traction before attacking use cases in the bottom-right quadrant. When you’ve already built up a customer base, you can release free tools to find a wedge into competitive and profitable use cases. Even if this outcome doesn’t happen for six months—or even a couple years—down the line, the decisions you make early on in your product have a direct impact on your future ability to compete. Take Clearbit, the lead-enrichment company, as an example. When lead-enrichment company Clearbit first started out, they realized that most companies didn’t want to add to another tool to their already crowded stack. Clearbit focused instead on building an API that allowed companies to enrich data that they already had. To target folks in sales and marketing, Clearbit then created a bunch of free tools to get their core product in front of a wider audience. Non-lucrative and competitive use-cases are difficult, because you have to burn a lot of cash upfront to pull customers away from a crowded market. Because the market isn’t profitable, your initial customers have lower LTVs and take a long time to pay back your cost of customer acquisition. This quadrant is risky, but can work with a good strategy and strong execution. One example is Zoom, the video conferencing startup that recently raised $100 million on a billion-dollar valuation. Built by former Cisco engineers, Zoom grew rapidly in a crowded space because it offered a premium product on a freemium model. While companies like Cisco focused on selling expensive video-conferencing hardware to the enterprise, consumer solutions like Google Hangouts and Skype were free—but known for being unreliable. Zoom quickly took over the video chat market for SMBs, and grew revenue by 200% for the year of 2016. Research isn’t a quick-and-dirty growth hack that will tell you exactly who your audience is and what product to build. It’s a tool that helps you identify opportunities by thinking deeply about customer problems. The upshot is that while the way we solve problems changes, the problems themselves stay the same. That means that what matters isn’t really what you build at all—it’s how you build it. Even if you’re successful early on, your customers will evolve, and you’ll have to evolve with them to survive. Doing research allows you to bake in the habit of customer-centricity into product development. You won’t always hit the mark, but building around the things that don’t change—your customers’ problems—allows you to learn why, and learn faster.